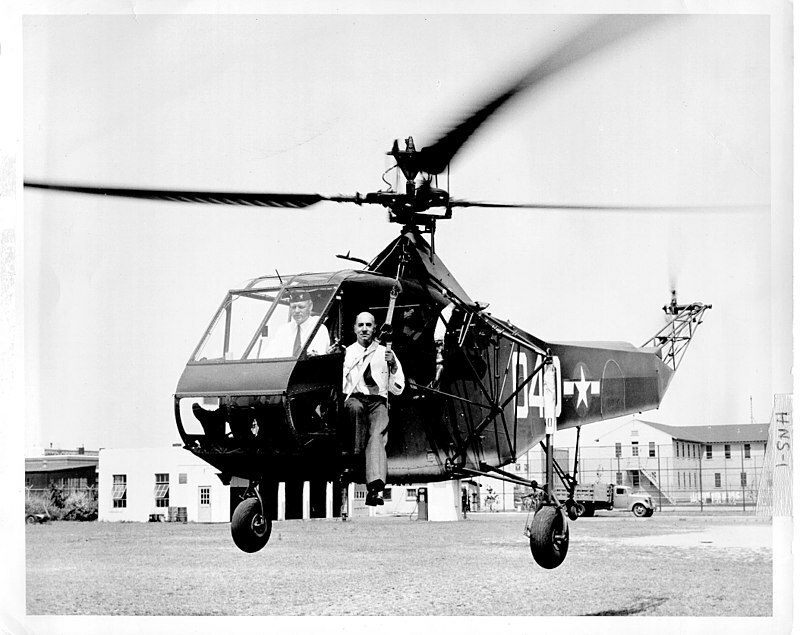 The Sikorsky R-4 was a two-seat helicopter designed by Igor Sikorsky with a single, three-bladed main rotor and powered by a radial engine. The R-4 was the world’s first large-scale mass-produced helicopter and the first helicopter used by the United States Army Air Forces, the United States Navy, the United States Coast Guard and the United Kingdom’s Royal Air Force and Royal Navy. In U.S. Navy and U.S. Coast Guard service, the helicopter was known as the Sikorsky HNS-1. In British service, it was known as the Hoverfly. The VS-316 was developed from the famous experimental VS-300 helicopter, invented by Igor Sikorsky and publicly demonstrated in 1940. The VS-316 was designated the XR-4, under the United States Army Air Forces’ series for “Rotorcraft”. The XR-4 first flew on 14 January 1942 and was accepted by the Army on 30 May 1942. The XR-4 exceeded all the previous helicopter endurance, altitude and airspeed records that had been set before it. The XR-4 completed a 761-mile (1,225 km) cross-country flight from Connecticut to Wright Field, Ohio, set a service ceiling record of 12,000 feet (3,700 m), while achieving 100 flight hours without a major incident and an airspeed approaching 90 mph (140 km/h). The British Admiralty, having learned of the VS-300, made a ship available that had been intended to show the USN their work with autogyros and ship operations. The Empire Mersey was fitted with an 80 ft × 40 ft (24 m × 12 m) landing platform. After her loss in 1942 to a U-boat, she was replaced by the SS Daghestan. The first deck-landing trials on Daghestan were carried out in 1944. The British received two of the first eight helicopters built. On 5 January 1943, the United States Army Air Forces ordered 29 prototypes. The first three prototypes were designated as the YR-4A and used for evaluation testing. The YR-4A benefited from a larger, 180 hp (130 kW) Warner Super Scarab (R-550-1) engine, compared to the 165 hp (123 kW) R-500-3 engine in the prototype, and a rotor diameter increased by one foot (30 cm). Evaluation of the YR-4A demonstrated a need for further improvements, including moving the tailwheel further towards the rear of the tailboom, venting the exhaust to the side instead of downward, and increasing the fuel capacity by 5 gallons (19 liters). 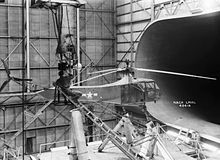 These and other design changes led to the designation of later prototypes as YR-4B, which were used for service testing and flight training. Following the sinking in January 1944 of USS Turner, a Sikorsky R-4 flew life saving blood plasma for the casualties from New York. On 22–23 April 1944, U.S. Army Lieutenant Carter Harman of the 1st Air Commando Group conducted the first combat rescue by helicopter using a YR-4B in the China-Burma-India theater. Despite the high altitude, humidity, and capacity for only a single passenger, Harman rescued a downed liaison aircraft pilot and his three British soldier passengers, two at a time. On 22–23 January 1945, another rescue by the R-4 involved several legs for refueling and navigating through passes between mountains nearly 10,000 feet (3,000 m) tall, to reach a weather station located at an elevation of 4,700 feet (1,400 m). The higher-than-normal altitude required a downhill run of 20 ft (6.1 m) to get airborne. While the R-4 was being used for rescues in Burma and China, it was also being used to ferry parts between floating Aviation Repair Units in the South Pacific. On 23 May 1944, six ships set sail with two R-4s on board each vessel. The ships had been configured as floating repair depots for damaged Army Air Forces aircraft in the South Pacific. When the helicopters were not being used to fly the parts from one location to another, they were enlisted for medical evacuation and other mercy missions. In Royal Air Force service, the R-4 was called the Hoverfly. The Helicopter Training School, formed January 1945 at RAF Andover, was the first British military unit to be equipped with the helicopter. Many RAF Hoverfly Mark Is were transferred to the Royal Navy for training and one was used in 1945/46 by Fairey Aviation to develop rotor systems for their Gyrodyne helicopter.